NEW ORLEANS, LA--(Marketwired - Sep 24, 2014) - Many of the streets in downtown New Orleans came to a stop last Friday as a parade featuring nearly 1,600 conference attendees, three marching bands, five floats, clowns and two elephants, paraded from the Hyatt Regency at the Superdome to Bourbon Street in the French Quarter. The parade was in celebration of VARTECH, a specialty electronics tradeshow and educational conference hosted by BlueStar, which featured the use of mobile and wearable technology. 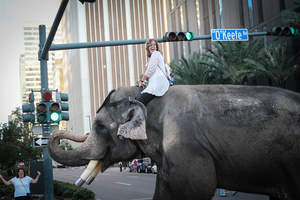 One such mobile technology highlight was witnessed when an event attendee won the chance to ride an 8,000 pound elephant through the streets of New Orleans at the head of a parade, all while streaming live video using Google Glass. Event attendees could enter a raffle for the chance to ride by donating at least $20 for the Cystic Fibrosis Foundation, which was collected at the tradeshow. "I am beyond excited, I have been waiting for this," said VARTECH attendee Colleen Wilson prior to getting on the elephant named Bo. "This is a 'bucket list' item, (and) I can't wait to (use) Google Glass all the way down Bourbon Street!" BlueStar, a global distributor of specialty electronics and technology, holds multiple annual events as part of the VARTECH Educational Series where attendees can learn about the latest industry advancements. This year's event had a mobility theme and event organizers encouraged attendees to "think outside the box" when considering new ways to grow their business. "We have always fostered innovation in the specialty electronics channel," says Mark Fraker, Vice President of Marketing for BlueStar. "Our industry, and the economy as a whole, is driven by innovation. We have been hosting VARTECH educational conventions around the Americas and Europe for the past 15 years, featuring cutting edge technology and electronic products to our partners. This year we created the 'World's Largest Four Legged HotSpot' to demonstrate trends in mobile and wearable technologies. In fact, we streamed video from the Google Glass to our website so our BlueStar employees and partners from around the globe could view the Technology Parade in real time." In addition to the parade that featured the world's largest four legged hotspot used to stream Google Glass, VARTECH attendees witnessed wireless robotics, streaming video via drone (UAV), innovative mobile solutions for business and more. The event also included a keynote speech from Archie Manning, a 3 on 3 soccer tournament, a Manning Football Experience at the Superdome, workshops and a tradeshow floor featuring the latest in RFID, ADC, POS and Digital Signage technology.